We had a very informative MANA community meeting this week! Below is a summary of some of the topics covered. 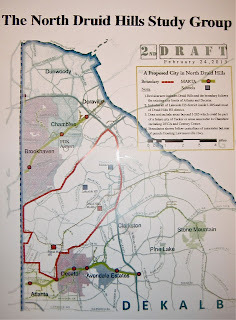 Cities: One of the topics discussed at MANA's community meeting last February 25 was the cityhood movement and we were able to see the latest draft of the proposed city of North Druid Hills. This is another example of the "city-lite" movement where cities are proposed to take control of a small subset of services (e.g., parks, zoning, public safety) while other services (e.g., water/sewage) are left for the County to handle. Waterworks is an important topic right now because DeKalb County has an aging system that desperately needs upgrades. One very real concern is that as more pieces of the tax digest are assigned to cities (via new cities or annexation into existing ones), the County receives a smaller slice of residential and commercial tax pie, and yet, is expected to continue to provide services for incorporated and unincorporated areas alike. People are frustrated with the way the County is being run and cityhood offers a sense of control over critical services. But neighbors are also conflicted about so-called "self-preservation" moves that alter municipal boundaries and impact residents in other parts of the County. Some are proposing ways to address specific problems without "abandoning" the County, so to speak. School improvement may be such a mechanism. Schools: Concerned parents have organized to explore a conversion charter school cluster for all schools feeding into North Druid Hills High School. MANA school liaison Tanya Myers explained that, while conversion of "traditional" public schools to public charters has been around for awhile, conversion of an entire cluster is a relatively new mechanism. Similar to other charter schools, some flexibility is given with respect to state and local requirements in exchange for a commitment from the charter to improve student achievement. An organizing committee comprised of two representatives from the seven schools in the cluster (Avondale, Briar Vista, Fernbank, Laurel Ridge, McClendon Elementary Schools plus Druid Hills Middle and Druid Hills High Schools) has just been formed. Should this exploratory committee determine that it is worthwhile to move forward with the initiative, it will then need to determine how to frame the charter document. Attendance zones for each of these schools would remain the same, whether or not the committee determines that it should move forward with a request for charter cluster status. See http://www.facebook.com/DruidHillsCharterCluster to learn more about this movement. 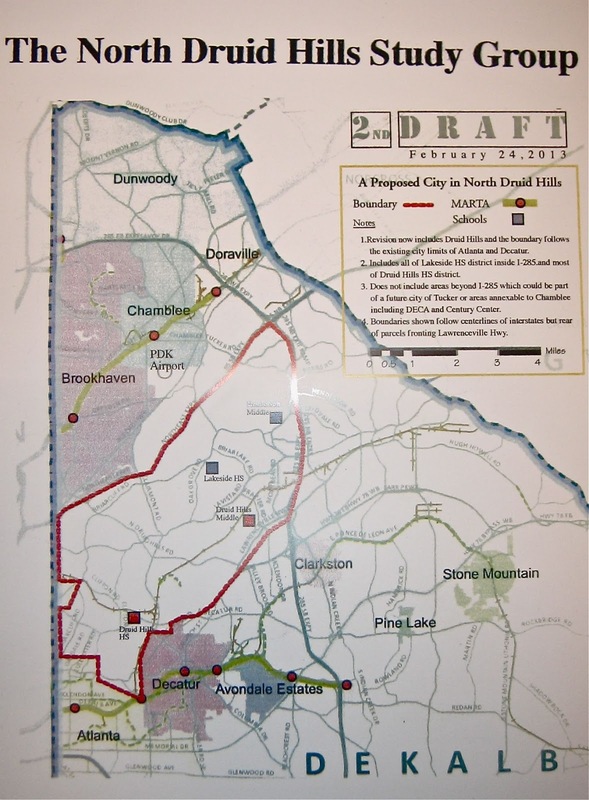 Regarding the updated draft 2 above, issued by the North Druid Hills Study group, notice that boundaries have been adjusted, following community input, to include additional areas served by North Druid Hills High School. Some side discussions at the MANA meeting raised the point that lines should be again adjusted to include the Medline LCI study area. discussed in the CAN website. Neighborhood Identity: The Civic Association Network (CAN) website continues to be the best source of information about the many issues currently affecting central DeKalb County. Although a lot of us are tired of hearing about cityhood proposals, annexation plans, and the sundry issues affecting the County, we must remain informed. With the upcoming redevelopment of Suburban Plaza, our proximity to so many large employment centers, and the approval of the Medline LCI revitalization study, our neighborhood is uniquely positioned. In the coming months and years, we will need to make decisions about the future of our area. Do people identify with Druid Hills, North DeKalb, the City of Decatur, none of the above? What happens if additional cities form around us and we choose to remain unincorporated? Also visit the Clairmont Heights Cityhood FAQ for additional information.